Driftwood is a very popular finish for furniture and home decor, but it isn’t always easy to find. 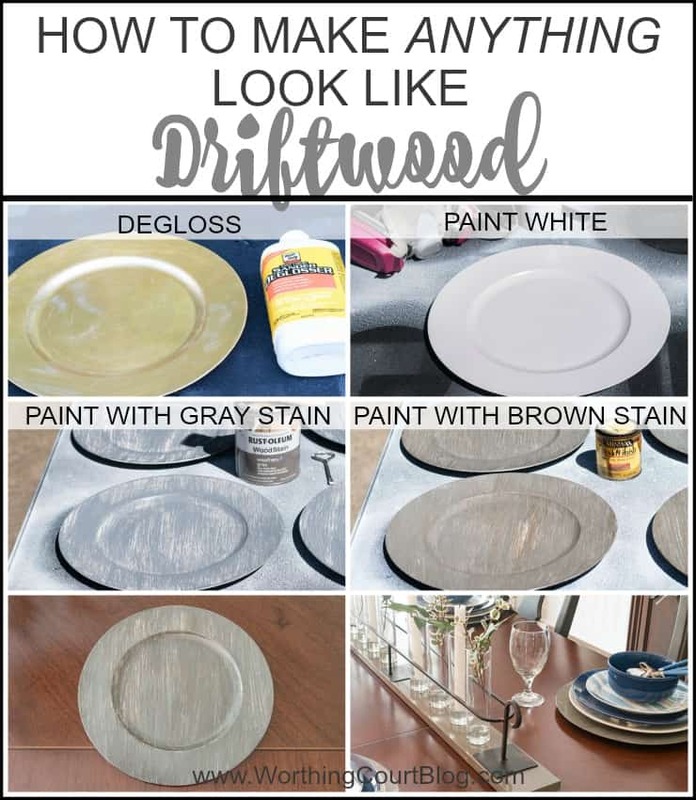 Here’s an easy 4-step formula to get the look of driftwood when you can’t find exactly what you’re looking for. Just because I can’t find the real thing very often, doesn’t mean that I can’t recreate the look though. 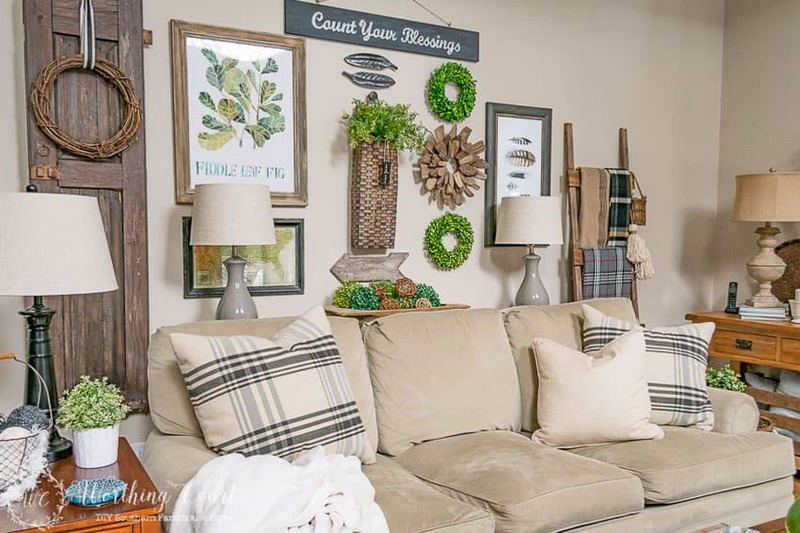 I love incorporating the look of driftwood with furniture pieces and with my home decor accessories. Using real driftwood pieces can be awfully pricey though – if you can even find it. So, after lots of experimenting with different techniques, I’ve come up with an almost too-easy-to-be-true formula to get the look and you can use it on anything! 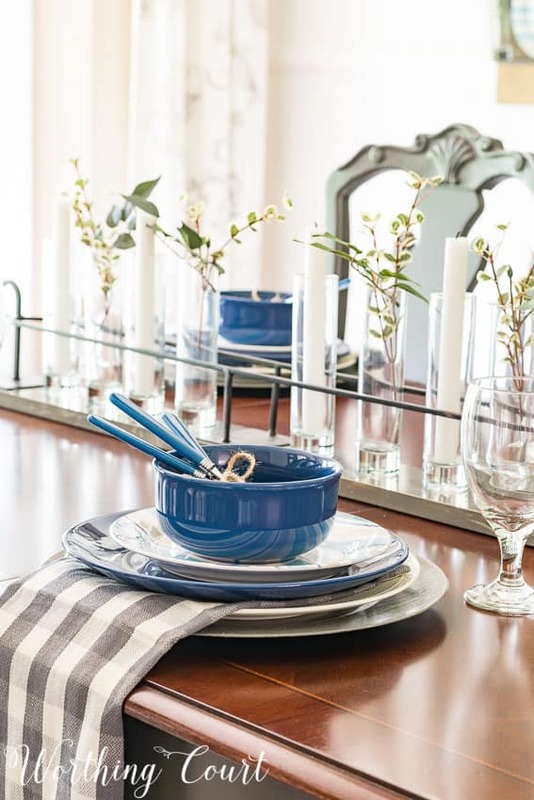 I most recently used my faux driftwood formula on the table setting for my summer dining room. Would you believe that the chargers under each place setting are plastic and used to be shiny gold? And that the piece of wood under the centerpiece is just a scrap of wood that we had lying around. You can’t see it very well, but I gave the faux driftwood treatment to it also. I used my driftwood formula on two different pieces that are part of the gallery wall above the sofa in our family room. One was on the picture frame that is holding the fiddle leaf fig print and the other was on a wooden arrow. The picture frame was originally black and the wooden arrow is made from unfinished wood. 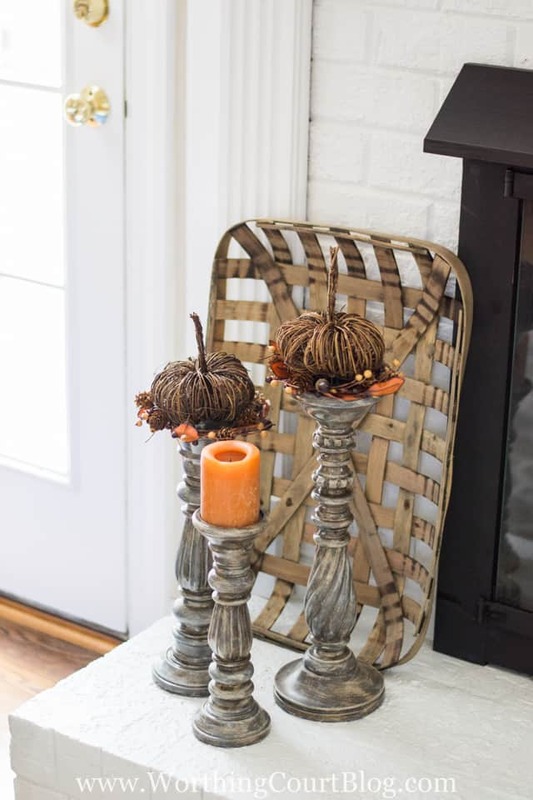 I get lots of questions about these candlesticks any time they make an appearance in a blog post. I bought them on clearance and they were originally painted red, green and yellow. Now that they look like driftwood, everyone wants to know where I found them. Using my shiny gold chargers as the example, let me show you just how easy my driftwood formula is! STEP 1: If the surface of your object is shiny, wipe it down with liquid sander/deglosser and allow it to dry. Liquid sander/deglosser can be found in the paint department of any big box home improvement store. STEP 2: Paint the object solid white and allow it to completely dry. You can use spray paint or paint from a bottle or can. STEP 3: Apply any brand of gray stain over the dried white paint. Make sure to keep all of your brushstrokes going in the same direction. STEP 4: While the gray stain is still wet, apply a coat of any shade or brand of brown stain over it – again keeping the brush strokes going in the same direction. Allow the piece to completely dry before using! Seal with a matte sealer, if you choose, but allow the piece to completely dry once again before using. Any shade of brown stain will work, but I would avoid an ebony or red mahogany shade to get this look. If you don’t want to wind up with shiny “driftwood”, be sure that the white paint you use has a flat finish. I like to apply the brown stain while the gray stain is still wet. The two kind of meld together and I believe it gives a more realistic look to the finished product. I use an inexpensive chip brush to apply the stain. In fact, I use the same brush for both stain colors. You may want to pour some of the brown stain into a separate container if you use the same brush for both colors. That way you won’t “contaminate” the whole can of brown stain with gray stain or vice versa. Don’t be afraid to add more gray or more brown to get the look that you’re after. There have been times when I’ve added more stain even after I thought the piece was finished and everything was dry. I’ve tried mixing up the steps for which color to apply when, but I think this method works the best. So, tell me – are you a driftwood lover too? Do you find yourself scouring the beaches looking for driftwood whenever you get a chance? I love, love, love the candlesticks. I am for sure going to give this a try. Thanks for all of your great ideas. You are an inspiration. Sounds easy! I need to try this! And to think I almost threw away my shiny silver chargers! Definitely going to use your technique to give them “new” life. Wow! It looks so easy! I’m not much of a driftwood lover but the candle holders turned out beautifully. I’m thinking I need some! Love your driftwood finish!!! Can’t wait to try it! I live too far from the beach to look for driftwood, so I am glad to know how to get that look by doing it myself! Wow, thanks for sharing this easy idea! The candlesticks look amazing and I’ve got some to try it on! Your chargers look great and never thought of painting them. I have some that could use this process. I will have to go driftwood shopping on the beach! I just discovered your blog last week and have already fallen in love with it!! WOW! I love this technique and the results. Thanks for sharing! I cannot wait to try your driftwood formula. Your candlesticks look amazing!! Thank you for sharing all of your wonderful ideas. Thanks for sharing. I am going to give this a try. Love those candlesticks. Love driftwood. We are blessed that we still have some on the rivers here in Alabama. But I love what you did with the chargers and candle sticks. You can’t find driftwood that look like chargers and candle sticks. I appreciate you showing us how to do this and as usual your blog is wonderful. Great idea!! I have a bunch of gold charges that I could paint like this. Thanks for the idea. I love this!!! My neighbor and I were just talking about how to make a furniture piece look like driftwood! Thank you so much for sharing how to achieve this! Thanks Susie, you have so many great ideas. I’m looking forward to seeing this in action. I know you said ‘any’ stain. But I need more detail. Do you use Wood stain, craft stain, ???? Hi Mildred. I use wood stain because that’s what I always have on hand. 😀 But, craft stain should work fine too. I love this idea and cannot wait to try it out. I’ve been looking for ways to get the driftwood look and this looks like a winner! Thank you!! Love the look of driftwood!! Hard to find in the Dallas area!!!! I can’t wait to get my old gold chargers out and try this!!!! Thank you for the formula!!! GREAT technique! I may just use it on my DIY ladder (via your tutorial), when I finally can *get* to that project! The candlesticks look great but looking at the I had a question….Did you rub the paint off in any spots or do it entirely with the brush and stains. Hi Roxann. Since I wasn’t going for a distressed/chippy look, I didn’t rub any areas off. If I happen to apply too much of one of the colors of stain, I wipe my brush practically dry on a rag and run it back through the stain to pull some of it off. Hope that makes sense! This looks great ! I think that I will give it a try! Darn, I should not have sold my gold charger plates at recent garage sale. I love the project for making items look like driftwood. I want to make some chargers! I was wondering where you purchased the “tobacco tray”. 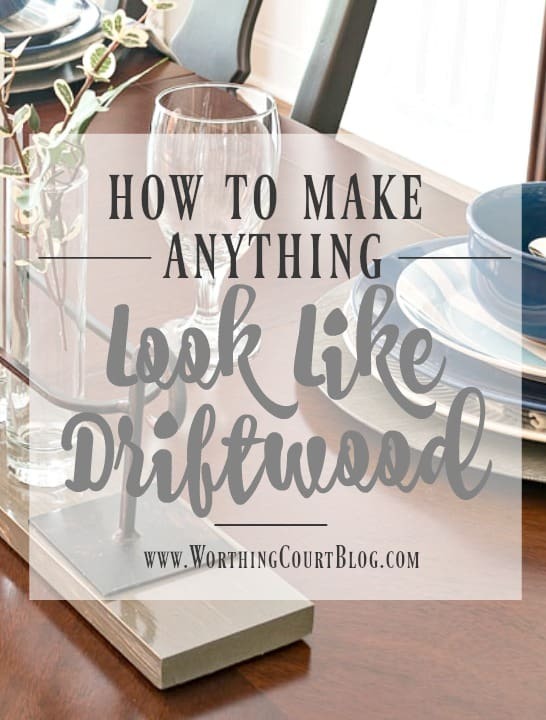 I love the look of driftwood and didn’t realize how easy it is to create the look! A must try!. Thank you for the step by step process. I just got back from the Outer Banks and I scoured the beach looking for driftwood. I found a few small pieces. I love your technique for getting the driftwood look and can’t wait to try it! I love all the natural colors. I have been working so much as of late and all I want to do is be home and play in my home. Reading my blogs each evening keeps me so inspired. Thanks so much. They does look super easy! Can’t wait to try it out! Glad I checked this out. I haven’t been able to find the chargers I have been envisioning. Now I can get those gold or silver ones at Hobby Lobby next time they are on sale and do this to them. Ha. Thank you. I love your ideas and the table centre decorations are beautiful. Thanks for sharing with us at #overthemoon link party. I’ve pinned and shared. What a great idea! I can’t believe how pretty the finished items are. Remarkable! This technique looks easy and it is a quite convincing imitation. I’m going to try it! I love this technique and will be trying it out soon. All of the examples look great. Suzy, This is such an awesome idea and I love the look. Thank you for sharing this at Share Your Style last week! Love the soft weathered colors of driftwood. 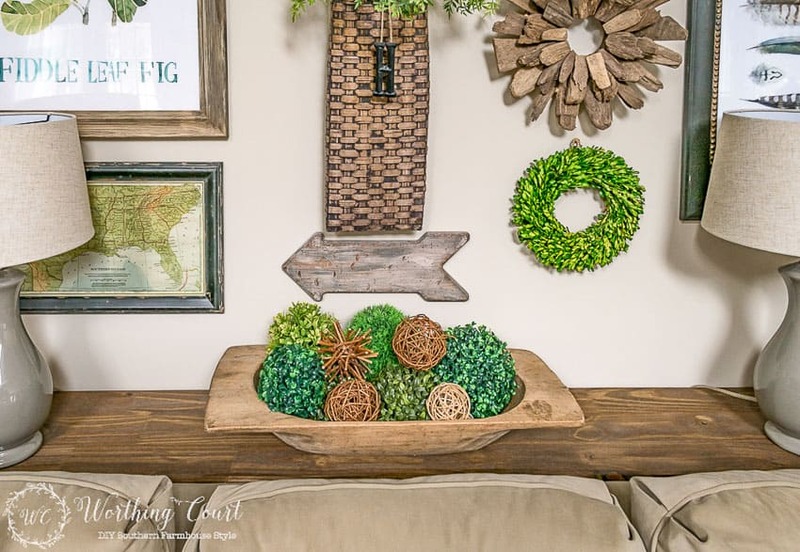 Thank you so much for sharing your wonderful DIY driftwood technique! Can’t wait to try it! Love it!! 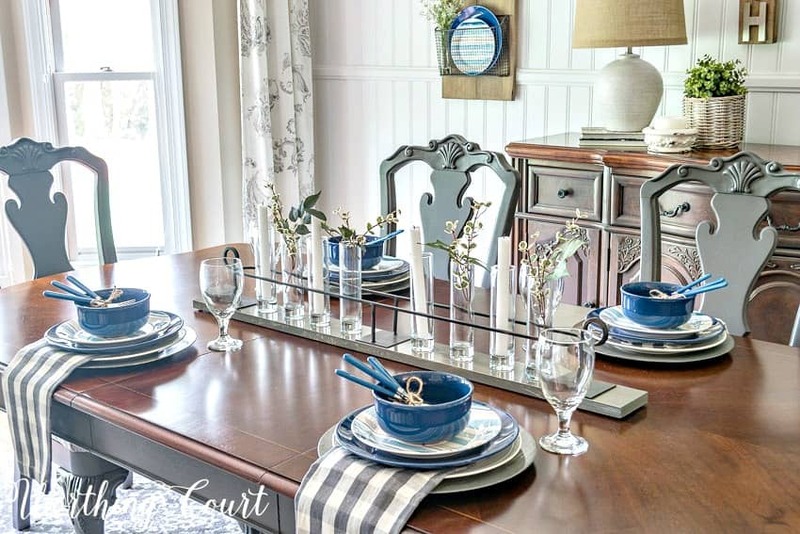 Where did you find your centerpiece? Love that it is long and narrow and not intrusive. I have several mis-matched chargers and other pieces that can be brought together with this driftwood look! Thanks for the diy, Suzy!! What a simple process. I love the look of driftwood too and have some items that need to be done. Appreciate you sharing your technique. Thanks! Ooh, I love this! What an excellent tutorial! Amazing how realistic and gorgeous this is, and not too hard. I could really go all out with this! Luv! Oh my word! I have three ceramic pillar candlesticks that I’ve been holding onto for years that would make the perfect candidate for this driftwood treatment. All I need to some grey stain. Thank you SO much for the great tutorial! I have candlesticks just waiting for this technique! I love driftwood and have a basket of pieces from Lake Superior on my mantel right now. Love, love, love the driftwood finish!!! Picking up some gray stain this morning to do some candlesticks. Thank you so much for sharing your formula! Wow, I need to try this! Love the candlesticks! Hi Mandy. Yes, I used latex products – both paint and stain. Have fun with your table! I used this technique this weekend on a full length mirror I have! The mirror frame is plastic and was originally black and now it looks like driftwood!! It looks amazing and was SO simple and quick to do! Thanks for the DIY tip! Now I am looking for things to make into “driftwood”! What a wonderful blog!! Question, Do you think it’s possible to get this effect with acrylic paint? Thanks, Margaret. Hi Margaret. Yes, I absolutely do! You’ll probably need to water down your paint to get that streaky look and acrylic paint will dry faster than stain,, so be aware of that. I recommend experimenting a bit on a piece of scrap wood or something before you try it on your actual piece. I love the look of driftwood! Do you think I could use this technique on painted paneled walls? I’m renovating my family room. Thanks! Hi Jackie. I think this technique can technically be done on a wall, but it all honestly I think it’s best for small projects. I live in a 1909 farmhouse with shiplap painted a “hospital blue/gray” and I was looking for a way to just paint that one wall to look like driftwood so it will coordinate with a couple of driftwood picture frames with seaside Morgan prints. Your technique looks like I can get this effect without all the sanding etc., that other methods are dictating. Here’s hoping the result comes out as great as your projects! Thank you! I just find your blog last 4-5 days and have already fallen in love with it!! I just found your blog this weekend and was excited to try the driftwood technique! My kids collected shells on the beach in Perdido Key, AL, in 1998. Finally figured out what to do with some of them! Wish I could post a picture to share my “Walk on the Beach” piece. I used this technique to paint a mirror for my bathroom and I love the look, but it came out darker than I wanted. Any tips to lightit up? Thanks! Hi Teresa. I would try dry brushing some white paint on it.